NutriStem® hPSC XF Medium is a widely published, defined, xeno-free, serum-free cell culture medium designed to support the growth and expansion of human induced pluripotent stem (hiPS) and human embryonic stem (hES) cells. Protocols have been established around the world for applications ranging from derivation to differentiation. 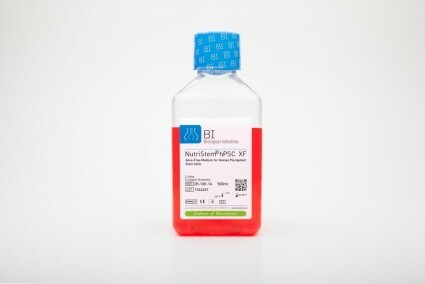 NutriStem® hPSC XF Medium offers the ability to culture cells in a completely xeno-free medium without the need for high levels of basic FGF and other stimulatory growth factors and cytokines. 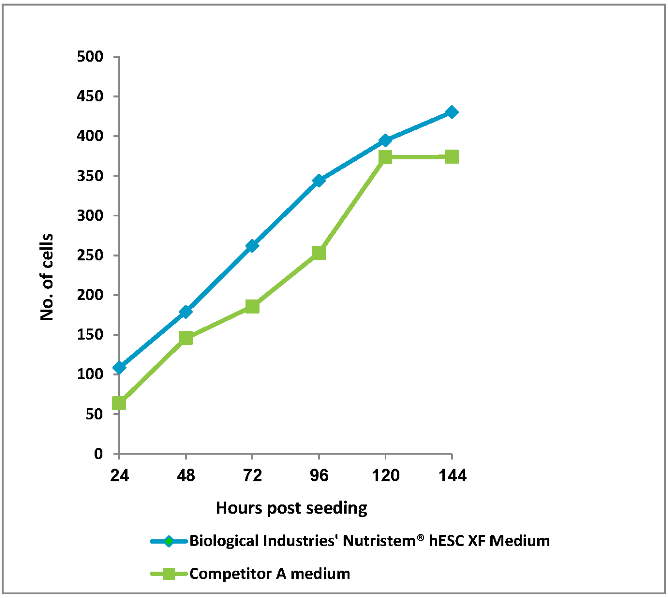 NutriStem® hPSC XF Medium exhibits a consistent media performance and predictable cellular behavior derived from a defined xeno-free formulation as well as increased reproducibility shown in long-term growth of over 50 passages. Low-protein formulation that contains stable L-alanyl-L-glutamine and HSA. Figure: 1 Human Embryonic Stem Cells (H1, passage 6) were seeded in 96-well plates (Matrigel coated) in BI's NutriStem® hPSC XF and competitor's media. Stem cell media were changed every 24 hours. 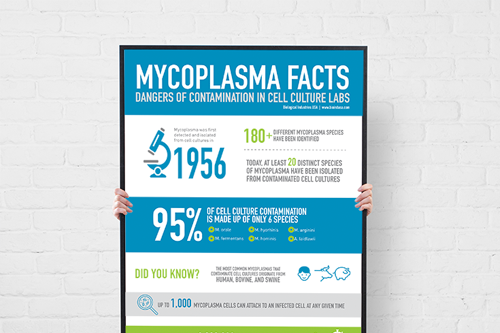 Number of cells was determined using CyQuant™ cell proliferation assay kit. Figure: Normal Colony Morphology. H1 hES cells (top panel) and ACS-1014 hiPS cells (bottom panel) cultured in NutriStem® hPSC XF Medium on Matrigel-coated plates display colony morphologies typical of normal feeder-free hES and hiPS cell cultures, including a uniform colony of tightly compacted cells and distinct colony edges. 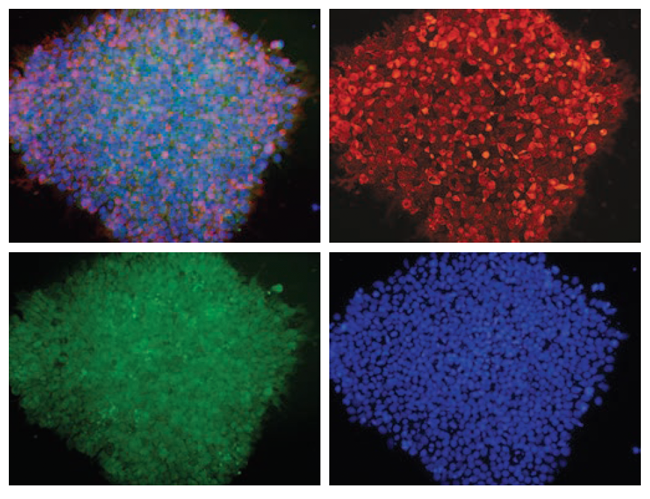 Figure: H1 cell morphology and immunofluorescence analysis of hESC markers red SSEA-4, green OCT4 and blue DAPI. H1 cells stained positive for the expression of pluripotency markers. 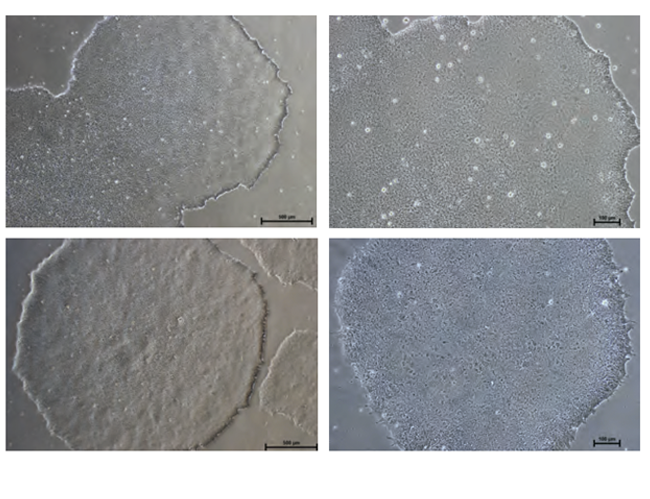 Figure: Embryoid bodies (EBs) were generated from H9.2 hES cells cultured for 16 passages in NutriStem® hPSC XF Medium on Matrigel matrix as an evaluation of pluripotency. The pluripotent H9.2 cells were suspended in serum-supplemented medium, where they spontaneously formed EBs containing cells of embryonic germ layers. 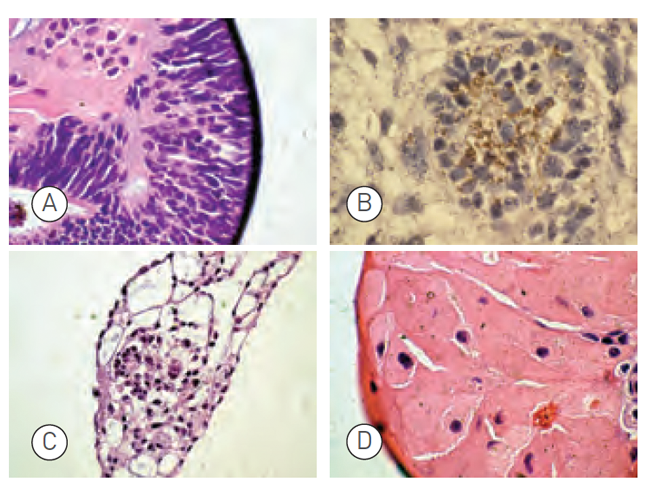 The following cell types were identified by examination of the histological sections of 14-day-old EBs stained with H&E: (A) neural rosette (ectoderm), (B) neural rosette stained with Tubulin, (C) primitive blood vessels (mesoderm), and (D) megakaryocytes (mesoderm). Figure: H9.2 hES cells were cultured for 11 passages in NutriStem® hPSC XF Medium using a human foreskin fibroblast (HFF) feeder layer. The hES cells were subsequently injected into the hind leg muscle of SCID-beige mice for in vitro evaluation of pluripotency. 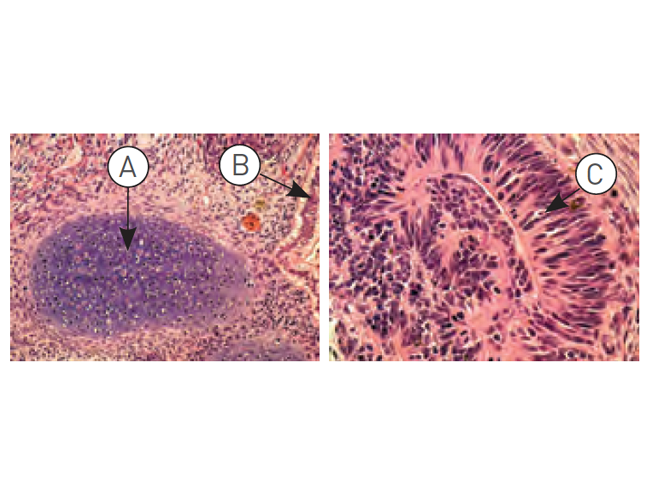 The following tissues from all three germ layers were identified in H&E-stained histological sections of the teratoma 12 weeks post-injection: (A) cartilage (mesoderm), (B) epithelium (endoderm), and (C) neural rosette (ectoderm). NutriStem® hPSC is routinely tested for optimal maintenance and expansion of undifferentiated hESCs. Additional standard evaluations are pH, osmolality, endotoxins and sterility tests. Note: A common feeder-free basement membrane matrix is Matrigel, which is not xeno-free. Effective xeno-free alternatives to Matrigel is recombinant laminin, such as LaminStem(R) 521 (BI Cat. No. 05-753-1F) which has been validated to successfully culture human ES and iPS cells using NutriStem® hPSC XF medium. NutriStem® hPSC XF is registered as an In-vitro diagnostic (IVD) medical device. NutriStem® is a registered trademark of Biological Industries​. A Drug Master File (DMF) for NutriStem® hPSC XF is available. N. Desai, P Rambhia and A. Gishto, Human embryonic stem cell cultivation: historical perspective and evolutionof xeno-free culture systems. Reproductive Biology and Endocrinology 13.1 (2015): 9. W. Siqin et al. Spider silk for xeno-free long-term self-renewal and differentiation of human pluripotent stem cells. Biomaterials 35.30 (2014): 8496-8502. 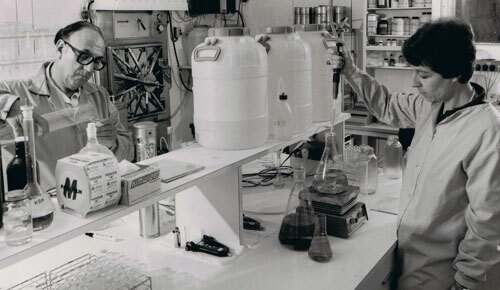 G. Finesilver, M. Kahana, E. Mitrani. Kidney-Specific Micro-Scaffolds and Kidney Derived Serum FreeConditioned Media support in vitro Expansion, Differentiation, and Organization of Human Embryonic Stem Cells. Tissue Engineering Part C: Methods. -Not available-, ahead of print. doi:10.1089/ten.TEC.2013.0574. J.Collins et al,. Highly Efficient Reprogramming to Pluripotency and Directed Differentiation of Human Cells withSynthetic Modified mRNA. Cell Stem Cell 7 (5): 618-630 (2010). SL Ji and SB Tang, Differentiation of retinal ganglion cells from induced pluripotent stem cells: a review. Int J Ophthalmol. 2019; 12(1): 152–160. Lenzi, J., et al. Differentiation of control and ALS mutant human iPSCs into functional skeletal muscle cells, a tool for the study of neuromuscolar diseases. Stem Cell Research: Volume 17, Issue 1, Pages 140–147, 2016. P.W. Burridge and E.T Zambidis. Highly efficient directed differentiation of human induced pluripotent stem cells into cardiomyocytes. 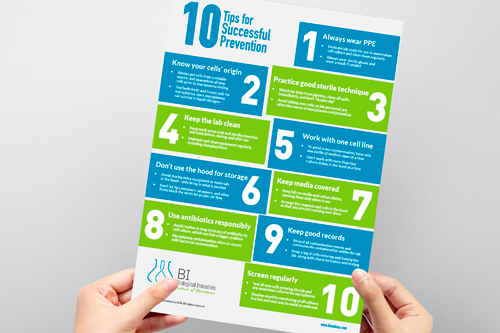 Pluripotent Stem Cells: Methods and Protocols. Methods in Molecular Biology, volume 997, pp 149-161, Humana Press, 2013. Tieng, V. et al.Engineering of Midbrain Organoids Containing Long-Lived Dopaminergic Neurons. Stem Cells and Development. February 2014, 23(13): 1535-1547. StemAdhere™ Defined Matrix for hPSC. Primorigen Biosciences website. R. S. Song et al. Generation, Expansion, and Differentiation of Human Induced Pluripotent Stem Cells (hiPSCs) Derived from the Umbilical Cords of Newborns. Current protocols in stem cell biology (2013): UNIT 1C.16. Q. Gu et al. 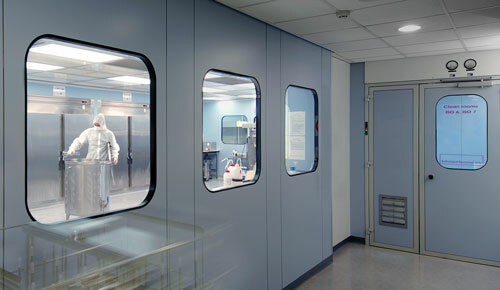 Accreditation of Biosafe Clinical-Grade Human Embryonic Stem Cells According to Chinese Regulations. Stem Cell Reports. 2017 Jul 11; 9(1): 366–380. P. Menasché et al.Human embryonic stem cell-derived cardiac progenitors for severe heart failure treatment: first clinical case report. European heart journal (2015): ehv189. S. Abbasalizadeh, H. Baharvand. Technologies progress and challenges towards cGMP manufacturing of human pluripotent stem cells based therapeutic products for allogeneic and autologous cell therapies. Biotechnology Advances: Volume 31, Issue 8, pp 1600-23, 2013. E. Zambidis, P Burridge. Compositions and Methods of Generating a Differentiated Mesodermal Cell. US Patent Application 20130136721, 2013.